This will be my last post on this blog. One day I might figure out how to combine my old and new blog. I have been on wordpress for two years, I’m happy with my new blog and am excited about where my blog is going. Here’s the link to my new blog . There it is, the last Miami room tour. I’m going to miss Miami, our apartment and the best fresh fruit juices. I don’t know if we will ever make our way back there to live but I know we will be back to visit. Adelaide started walking in that apartment, I know we’ll never forget it. Day 4 (not pictured): I was so busy all day I didn’t have time to worry about any thing else, so I never changed out of my lounge wear. Day 10 (not pictured): It was extremely cold outside, and I didn’t want to change out of my tights. I was asked by a friend to join a 10 x 10 group, along with other friends, so we could encourage each other in the Fall 10 x 10 challenge. Before I share what I learned from the 10 x 10 challenge, I’d like to explain what the challenge entailed. For the 10 x 10 challenge, we each picked 10 pieces from our closet: pants, shirts, dresses, shoes, etc., and for 10 Days we only wore those 10 items, not including socks or accessories. Click here for the original 10 x 10 creator and blog post explaining the challenge. I felt like I had really thought out each clothing piece carefully before entering the challenge, but after 10 days, I was ready for it to be over. I didn’t pick out the pieces as well as I thought because I didn’t consider comfort into the equation, and I quickly became very bored with the outfits. Let me just say that as a stay at home mom who also works from home, comfort is a huge factor. It’s not always necessary for me to dress up each day when I’m in the house all day. I chose two pairs of shoes, and I wore both of them on a daily basis, which was not always practical around the house. If I had chosen leggings, instead of the second pair of shoes, that would have been a lot more comfortable. I chose three dresses. The red dress in the picture above was very versatile; I could alternate the shirt under and over the dress to mix it up. I wore the other two dresses alone, which seemed like a great idea, since no other pieces were needed to dress them up, but then there was no options of changing the look with different tops or bottoms, so it really limited my options when I was only allowed 10 pieces of clothing. My favorite piece was probably my Jumper. It was comfortable, versatile, and I didn’t mind wearing it multiple times in 10 days. I chose 3 shirts, a vintage light short sleeve button up, a black light short sleeve button up, and a white plain T-shirt. I later changed the white T-shirt out for a long sleeve button up, since the weather became unexpectedly cold in Florida. I hadn’t worn the white T-shirt yet, so I didn’t feel like I had broken any rules by switching it out. Even though I had one long sleeve shirt, I didn’t feel like it was enough, and I stayed cold for the rest of the week. This is another area, where if the weather had been consistent, I might have chosen better clothing pieces that would have worked for all 10 days. Finally, I choose one pair of pants, that could be worn under dresses or alone, since they were a tight fit. Although the look of these pants were versatile, they were lacking in comfort. They were not the type of pants for sitting long periods of time. I wish I had chosen jeans or leggings instead of the tight fit pants. I feel like I could try the 10 x 10 challenge again, now that I’ve done it once, and I know what to expect. Next time, If I decide to take this challenge, I will be more prepared in choosing outfits for comfort, work, and the weather. I can’t live on this challenge because I become bored with the limit of 10 clothing pieces before the 10 days are up. The challenge was a great way for me to test out my clothes and see which ones really hold up to every day wear. This challenge will make me more mindful of the clothes I buy in the future and ask myself the questions: is this comfortable, versatile, and fun. One more thing I learned, that I have been practicing for the past 3 years, is that more than 10 shoes in your wardrobe at a time is not necessary. I have scaled back my shoes over the last 3 years, and I don’t miss the variety. I find that I wear the same shoes on a daily basis as it is, and there is no reason for the extra clutter. I’ve just tried to be more mindful and not make any impulse purchases. Wearing the same 2 pair of shoes for 10 days is something that I had already been doing before I took the 10 x 10 challenge. It’s been 5 weeks since we moved, and I am feeling the withdraws. I miss the beauty, culture and busyness of Miami, but I don’t miss everything else, like the traffic, noise, impossibility of getting a parking spot in our local Publix, or the high expenses for everything. I also miss family and friends while from Miami. Do you see the oxymoron of the situation? I miss Miami, but when I was in Miami, I missed being closer to family and friends in Jax. I sometimes say I wish I could take Coral Gables, FL and drop it in Jacksonville. I would be so happy. We can’t have everything, so I’m thankful to be where we are now, and visit Miami as much as we can. I’ll just look back on these pictures to remember our apartment and Miami’s beauty. I am thankful that I didn’t just visit Miami, but I actually lived it. I feel like it’s similar to New York city. It’s never enough just to visit, you have to live it to get the full experience. I hope Alice Jane remembers Miami as she grows up. I know she loved living there and says how she misses it all the time. I was that mom. The mom that had to back out of Alice Jane’s classroom door, because I didn’t want to take my eyes off of her, in case she waved goodbye, or needed to see me one last time. The mom that slowly closed the door, all the while peeking through till the last second. The mom that had her face in the window of the door, praying she would look my way. I was that mom. I wish I could say I’m embarrassed, but I’m not. I should be embarrassed. I’m not the first mom to drop her child off at school. It’s totally normal, but when you spend every moment of the day with your child, being in all of their special moments, it’s hard to know they are going to be having special moments at school, that I will never get to be a part of. I want to watch her answer questions right, and see her excited about learning something new, or getting good marks because she listened to the teacher and was kind. 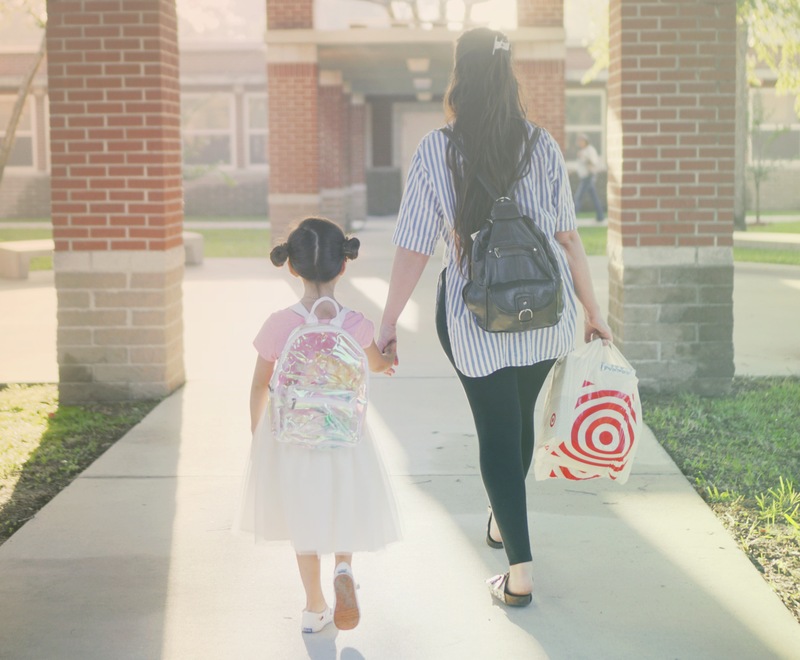 So, although dropping your child off at school is totally normal, it’s a huge step knowing that you’ve finally reached that point in their life where they are no longer a baby. No longer will I be the only one to experience all of her quirks and chats. No longer will I witness all of her achievements. That moment where you have to let go, not completely, she’s not 18, but let go more than I ever have before. I know it’s worth it. 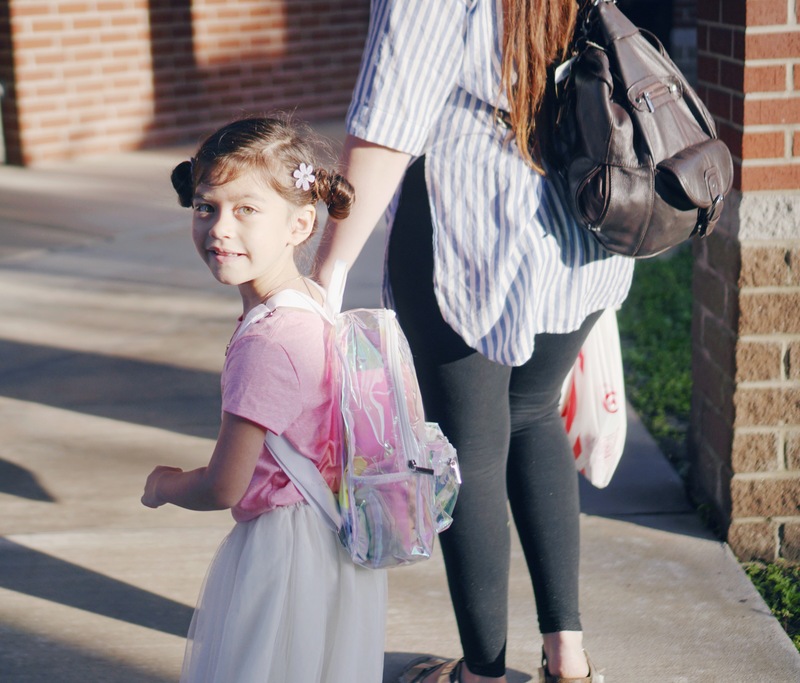 She loves school, she loves to learn, and she loves making new friends, so that leaves me looking through the window watching from a distance, while she grows into someone I know I will be proud of.